OS X’s built-in Time Machine feature makes backing up your important data a relatively painless process: You just connect a drive to your Mac, tell the OS to use that drive for Time Machine, and then, to quote a famous Apple ad, “There is no Step 3.” As long as Time Machine doesn’t run into any problems, it works great. But when Time Machine does experience a glitch, it’s not always clear what went wrong. The Time Machine pane of System Preferences provides a red Info (i) button that can sometimes fill you in on the details, but not always, and if Time Machine should face multiple issues, that button provides only the latest error message. The info you really want is buried in OS X’s system logs...along with thousands of lines of information that has nothing to do with Time Machine. You could use the Console utility (in /Applications/Utilities) to try to uncover the relevant info, but Ron van Rens’s $2 LogViewer for Time Machine (Mac App Store link) is a better approach. This simply utility does one thing: It parses OS X’s system logs to find just the information relating to your Time Machine backups; formats that information for easier reading; and presents the data to you in a browsable interface. Any errors are displayed in red type, making them easy to spot. 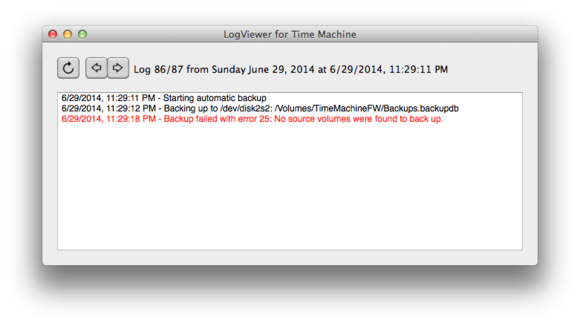 When you launch LogViewer for Time Machine, it displays details about the most-recent backup. Clicking the Back and Forward (left and right arrow, respectively) buttons lets you browse any other backup-related entries in your Time Machine log. The information you see is still in log-file language, but most Time Machine lines are easy enough to interpret. One significant complaint I have is that LogViewer for Time Machine doesn’t automatically refresh its display when the Time Machine log file is updated. You must manually click the Refresh button to see the latest info—multiple times if you’re monitoring a backup that’s in progress. Here’s hoping such a feature finds its way into a future update. Until then, LogViewer for Time Machine is still an easy way to keep an eye on your Time Machine backups.